Recent custom pieces by Mardon show off some reasons why people have us make custom jewelry. 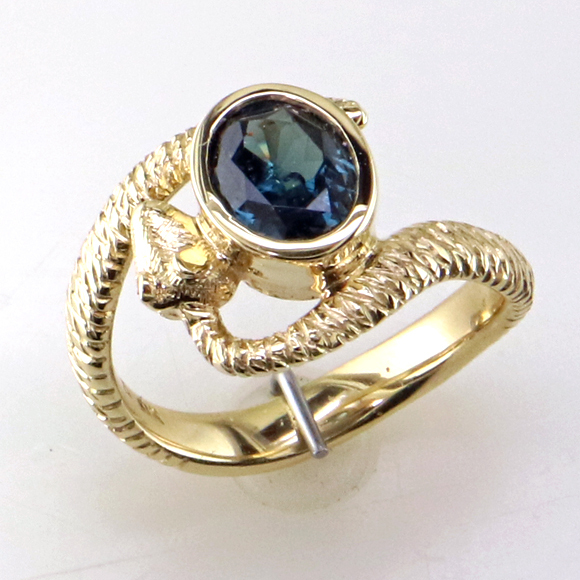 We made this snake ring set with a rare gem for a long time client who has a taste for Asian art. We made her a custom diamond ring several years ago that featured Asian style dragons on both sides of a very nice round diamond. This new piece features a serpent wrapped around a rare color change garnet from Africa. Color change garnets have been mined in Tanzania, Madagascar and Sri Lanka since the 1980’s. Production has been mostly small stones– this 1.20 ct gem is large for the type. They are a variety of Pyrope Garnet. According to one mineralogist, they are mix of 80% Pyrope, 10% Spessartine, and 10% Almandine. Like the alexandrite, they have the rare property of appearing red to pink in incandescent light and blue green in daylight. Our client has become intrigued by some of the rare gems we feature in our shop, and wanted something very unusual. She was delighted with her new ring. This unique design is based on a vintage Art Deco ring collected by our client who buys and sells vintage jewelry. She loved the design, but wanted something in white gold that would be good for everyday wear. 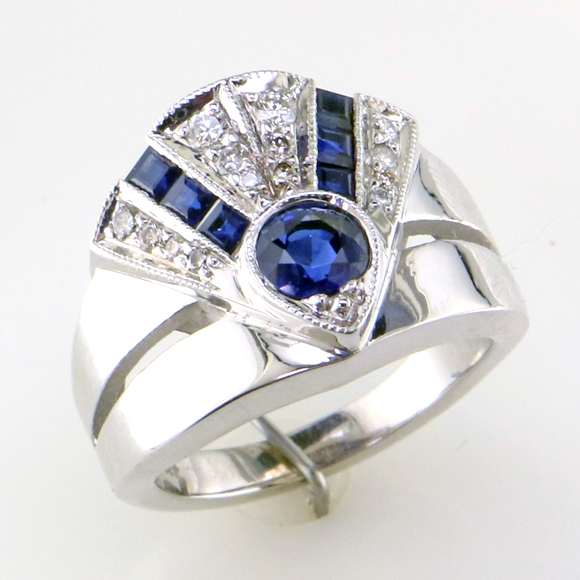 Our CAD wizard, Jenny, worked with her to develop this great looking white gold ring set with diamonds and blue sapphires. Simply stunning! 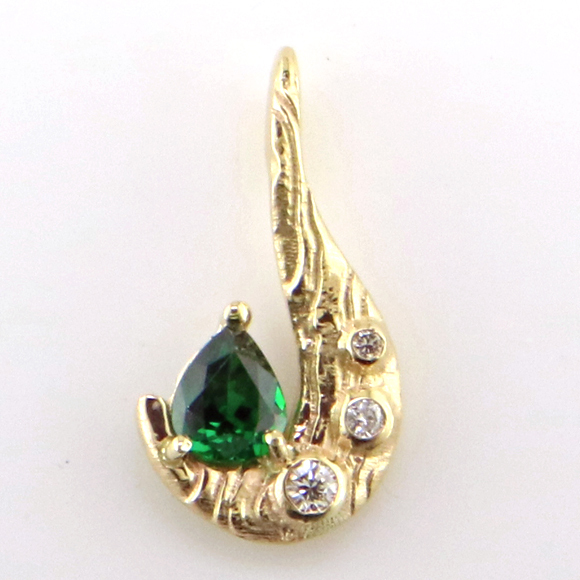 This intriguing pendant was made for a couple who’ve traveled extensively and had bought the pear shaped Tsavorite garnet on one of their trips. The owner brought us a sketch of his design. The tricky part was that he wanted a textured surface around the stones that is reminiscent of the surface inside an abalone shell. Jenny was able to translate his thoughts successfully; he told us we captured just what he had in mind. The stone had been worn in a ring for years so it was pretty scuffed up. Our lapidary re-faceted the top with just a few points of weight lost. 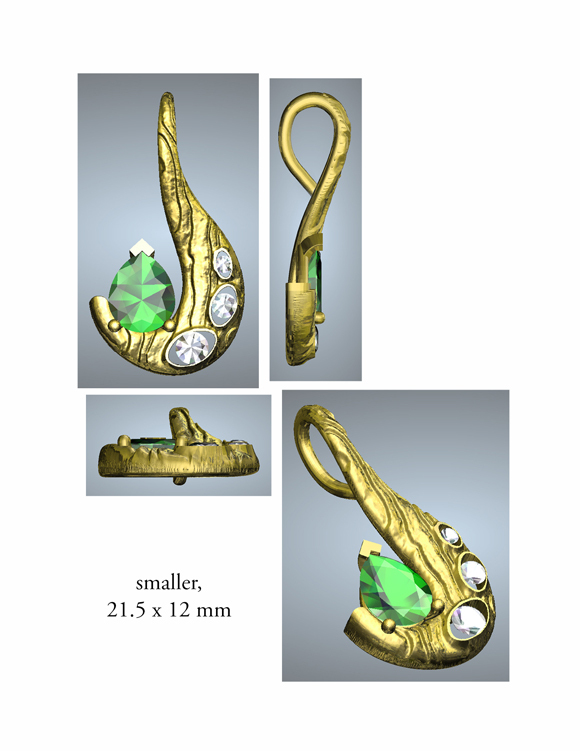 The new owner was delighted– she hadn’t seen the Tsavorite so sparkly in years. At Mardon, we make custom jewelry starting with a idea, sometimes a simple sketch. We develop your ideas into a CAD rendering which illustrates the new design perfectly. The CAD design is then made into a castable model by our CNC mill which carves the model out of wax or by our 3D printer which grows the model out of plastic resins. 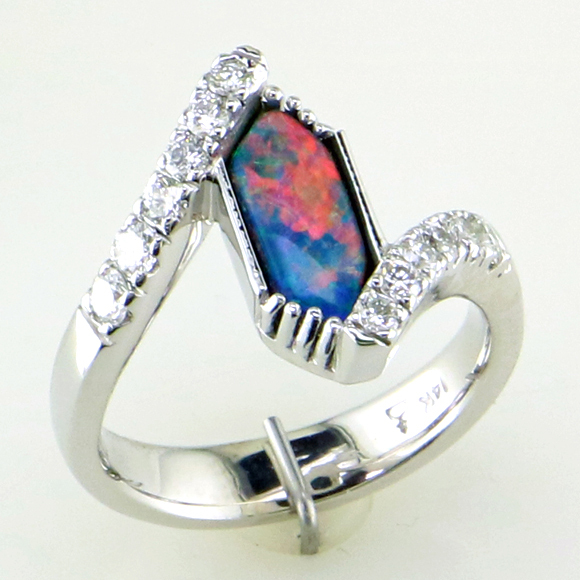 It’s our job to help you realize your ideas and desires into a new piece of jewelry that suits your lifestyle. We’re a true manufacturing jeweler working directly with consumers. You can visit our shop at 5225 Canyon Crest Drive, #14, Tuesday thru Saturday, 10 to 5:30. Don’t forget to cast your ballot online for the 2018 Annual Reader’s Choice survey — Sunday, June 3 is the last day you can vote. We hope you’ll choose Mardon as the Best Jeweler of the Inland Empire–for the tenth year in a row! Thanks for all your votes. You can take the entire survey for your choices for best local shopping, restaurants and services. For your ballot to count, vote for at least 25 categories — it’s easy and fun. And you can vote every day! Voting ends this Sunday, June 3. We thank you for your vote and support– this recognition inspires us and helps us keep going to bring you beautiful custom pieces like the ones shown in this post. This entry was posted on Friday, June 1st, 2018 at 5:48 pm	and is filed under Custom Jewelry, Featured Post, Gemstones, Jewelry Services. You can follow any responses to this entry through the RSS 2.0 feed. Both comments and pings are currently closed.